Aikido is a modern Japanese art of self-defence which evolved from several traditional warrior arts. It is characterised by its flowing and graceful movements. Aikido literally means “the path to living in harmony with your Ki”. That’s quite a mouthful, but what does it actually mean? Every martial art has an attacker and a defender. For instance, an attacker may make a strike to the head of the defender. Of course, the defender cannot remain passive: he or she will have to move. He or she can move in such a way that the two flows of movement (Ki) will meet without clashing, flowing together in harmony (Ai = harmony). This allows the defender to gain control of his or her attacker, but without any physical trials of strength and without any harm done to the attacker. 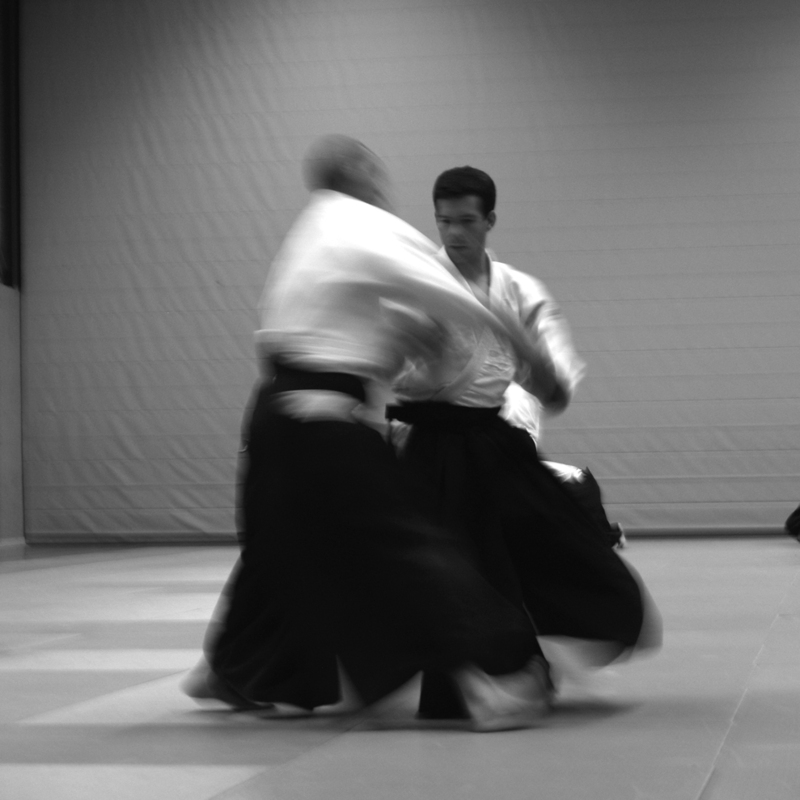 DO in aikido literally means “the way”: the process of learning to understand this and to learning how to apply it. Aikido’s elegant nature, due to the circular movements that are performed in a controlled, calm manner, has often been compared to dancing. 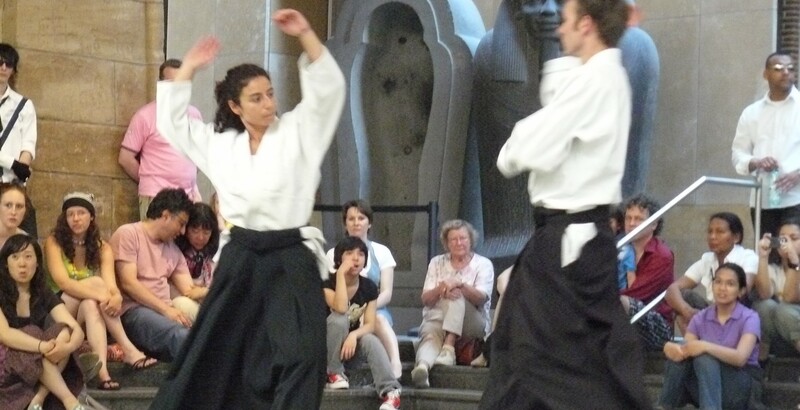 These aikido lessons are designed to help you develop solid mental and physical foundations. During the training sessions, you will learn how to cope with aggression and stress in way that is often in contrast with what your acquired reflexes have taught you to do. If someone were to (suddenly) grab you forcefully from behind, you will freeze and then try and pull yourself loose. If the other person is a lot stronger than you are, you will probably not succeed. However, Aikido has many martial principles that can offer a solution for situations like this. If you suddenly find yourself under pressure, you will automatically freeze. If you can learn to deal with these stressful situations, i.e. if you can learn to remain calm (inside), you will have martial superiority and you will be capable of making sensible decisions. In aikido class, you will learn to defend yourself while maintaining this inner calm; you will be able to maintain your balance and you will discover what you of capable of doing with your own energy and that of others. Aikido does not have any competitions: there are no winners and no losers. It is not the objective to eliminate your opponent in a match; the intention is to study and learn to apply martial principles taught during class. One of these principles is the control of the correct distance between you and your attacker. For example, if you move too far outside your opponent’s reach, you will lose the centre of the movement and you will lose your own balance. During classes, the “attacker” and the “defender” work together. You allow each other the opportunity to examine aikido principles and to master them. This cooperation is an important aspect and is based on mutual respect. Aikido is a form of exercise practised in an environment that does not focus on competition but rather on the aspects of personal development, health and pure enjoyment of the movements. The word DO in Aikido leads to personal growth and insight: a path that does not demand physical strength, so it is suitable for both young and old. You will learn that you do not need to use great physical strength, but that you can move in harmony (AI) with your opponent’s attacking movement (KI). O’Sensei, aikido’s founder, Morihei Ueshiba, was born on 14 December 1883. It is said that Iwama is the birthplace of modern aikido, “the way of harmony”. Initially, his system was called Aikijutsu and then Aiki-Budo. 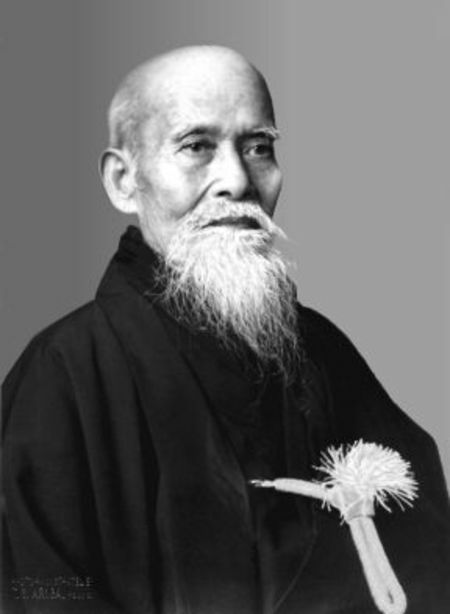 Morihei Ueshiba perfected it and, as the O’Sensei, taught the aikido techniques and philosophy first in Iwama officially, until his death.